Congrats to Sherry Fralic who posted a comment to my post "Quick Little Handmade Gifts". Sherry will receive the "Sweet Home" Level 1 Scrapbook Kit from me! Thank you to everyone who posted such nice comments on my posts. I am having such fun using the Christmas items I've made over the past few months, and so very glad to hear that you all, too, are using yours and making people happy. 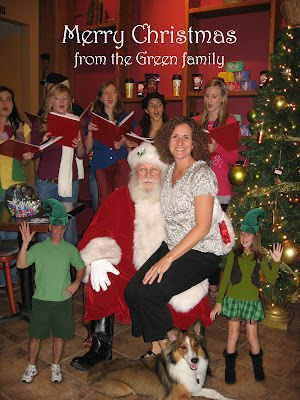 Take a peek at my doctored photo we used for the cover of our family Christmas card this year. (Click on it to get a good close-up view.) We sent it to all of our out-of-towners who don't see us often. After looking at the photo, go back to my earlier post "Still a Kid..." You'll see the original photo there. I told my husband when I opened that photo for the first time in my computer, I thought this photo would be perfect for a Christmas card if I was single. He said, "Well, why don't you add me and Jamie as little elves." What a great idea! So I Photoshopped them in there, changed their clothes to green, added some elf hats (from Google images), added a photo of Suki (our Sheltie) and then finished it all off with soft shadows to make them really seem like they're in the photo rather than a cardboard cut-out, and VOILA! I guess those years as a graphic designer weren't a total waste. 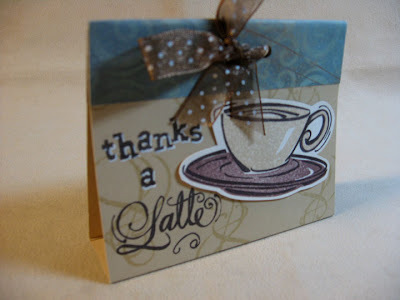 If I had enough supplies to do so, every card I ever made would have a coffee theme. I've already waxed poetic about coffee in a earlier post, so I won't go into it again. Let's just say I love my morning coffee and basically ALL things coffee. It's crazy! 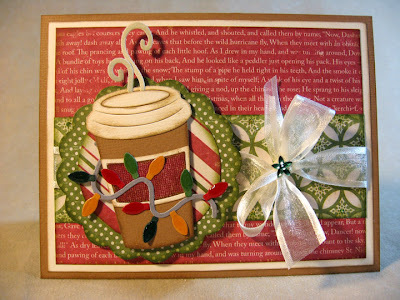 And since I'm meeting my friend Lisa C. for coffee in the morning, I thought I'd make her a Christmas card with a coffee theme. She's my coffee buddy, but her hot beverage of choice is not coffee at all. She's a Chai kind of gal. 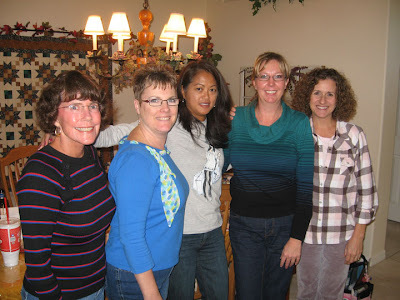 We meet every other week or so, catch up on the kids, school, husbands, and other general life topics. Now that I have an espresso maker at home, I don't frequent the coffee house like I used to, so I look forward to it when I can hang out there. 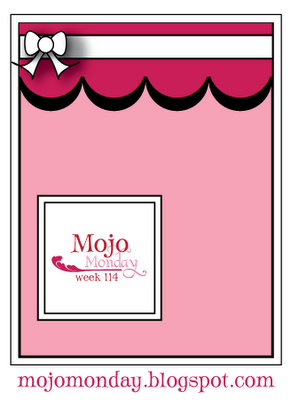 The Mojo Monday sketch for today lent itself nicely to my coffee themed card. Still a Kid, but Am I Really? I don't care how many times I have to be reminded that I'm over 40 and not a kid anymore, it still doesn't sink in. (Well,... until I pass in front of a mirror.) When it comes to Christmas, I'm still just a big kid at heart. 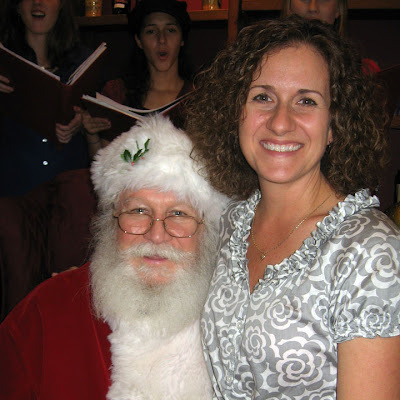 I love carolers, decorations, lights, the hustle & bustle of extra shoppers in the stores, the Christmas cookies and parties, and seeing the real – yes, REAL – Santa Claus! 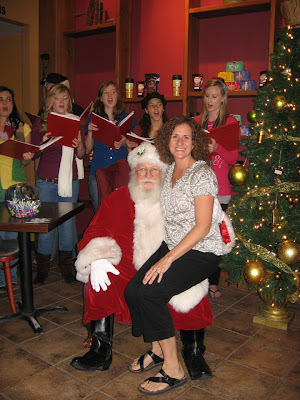 I got to sit on this real Santa's lap the other day at Indian River Coffee Company during a holiday event held there. Carolers from Merritt Island Christian School performed while coffee drinkers made greeting cards with me and my fellow consultant Jacki for the troops overseas during the holidays. They were so amazingly talented, those carolers. So sweet and smooth was their harmony. I especially loved the deep baritone of the male singers. I could have sat there all day listening to them. But back to Santa. This guy was the real deal. He had the beard, the white hair, the rosy cheeks and the belly that shook like a bowl full of jelly. While I was a bit sheepish, but not terribly so, I asked Santa if I should sit next to him, so as not to crush his jolly old leg. But he insisted he was up to the task, so down I sat. While Jacki took a few photos, I sat there like a happy little tyke, all grins and giggles, then Santa started offering Jacki photo-taking techniques. I guess he's kind of an expert on the subject, having been photographed about a bezillion times. Happy with the outcome, I thanked Santa for the photo-op and went back to my seat. Later that evening, when I was tucked snug in my bed waiting for the sugarplums, I realized with dismay that I forgot to tell Santa what I wanted for Christmas! Whatever shall I do? Truth be told, when I gave it some thought, had Santa asked me what I wanted I couldn't have come up with anything in particular. I found that odd, since every year since I can remember I've always had a list of things a mile long. At first I was worried, wondering to myself, "Am I turning into an old fuddy-duddy who doesn't get excited about wanting a gift anymore?" The things I can actually think up are things that I can and usually do buy for myself throughout the year. "Maybe I'm buying too much stuff," I said to myself. I reflected on how it was when I was little. The only time of the year that I got toys or special gifts was either my birthday or Christmas, and those dates are a week apart. So it was a full year until I got any "stuff" again. It got me looking at my daughter's life. Being a child in this day and age is so much different. We certainly aren't the type of parents to buy her any and everything she wants anytime she wants it, but we do buy her things she really likes throughout the year, if we feel she has earned or deserved them. But then, she still comes up with that mile-long list come Christmas and she still gets excited about getting presents. What has happened to me? Now giving gifts has become my favorite part of Christmas. I love to make handmade gifts as much as I have time for. There's nothing like the look on someone's face when you've given them something they really love and enjoy that you made with your own hands and heart. It's the best feeling I know! I cannot believe that Christmas is almost here. Us Floridians always have this problem. The warm weather sticks with us so long, it takes a little imagination to feel festive and get in the holiday spirit. The stores can decorate early all they want in October, but when the temps are still in the 90s outside, it just doesn't click in my head. The thing that ends up happening as a result, at least for me, is I'm scrambling at the last minute. 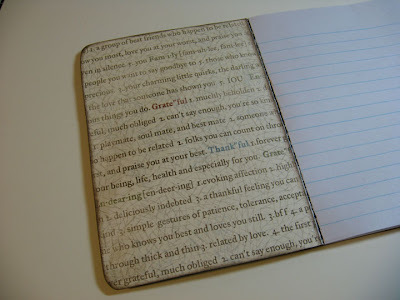 We all need those small gifts to give as thank-you's during the holidays. And those little gifts are the ones that are so important because the gesture itself says a lot. It doesn't always have to be a huge, extravagant gift. If it's handmade and cute, it's always a hit. 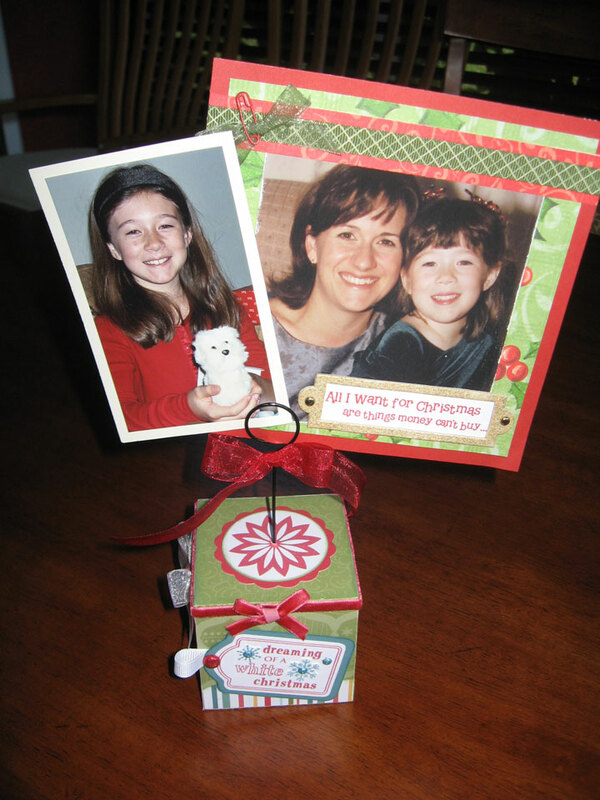 Here are a few of my favorite little quick gifts I've made this year and in years past. They're cheap, easy and cute, and I love making them because I get to use up paper scraps, leftover chipboard, stickers, ribbon and other do-dads. Anyone who knows me knows how I love my coffee. What could be better than enjoying my favorite grocery store Starbucks Frap drink, then repurposing that cute little bottle by adding some festive paper, simple stamping and a little ribbon? 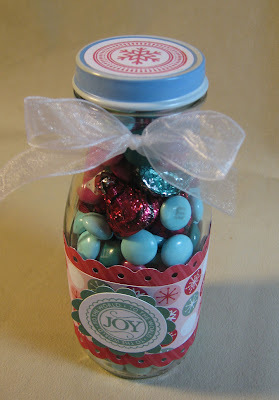 I add candies that match the paper and that little touch completes the gift so nicely! 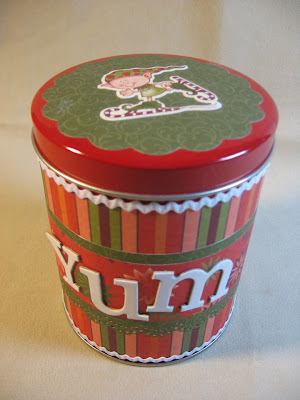 This little red tin was about $2 at Michael's. 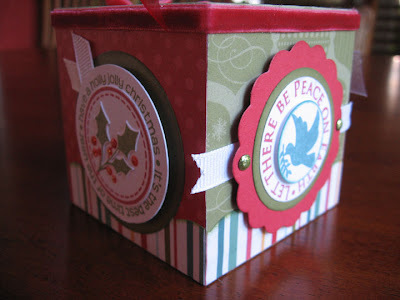 A little holiday paper, ric-rac ribbon and some leftover chipboard letters make this the perfect little cookie tin. My daughter and I like to fill these with our gingerbread men and give them out to the crossing guards on the way to school. Did I mention how I love my coffee? I just assume that everyone else does too. This is simply cardstock, paper, stamping and some ribbon. I put some International Foods Latte mix in a little zip bag and stapled it inside the tented cardstock. The good old pie-box. These are in abundance at Oriental Trading and other craft stores. Plain white and flat, they are easy to stamp and cover with paper, then assemble and insert something sweet inside. I love the wood craft aisle at the local craft store. There are so many cute little boxes and things that are so cheap! This little handle box was $1. 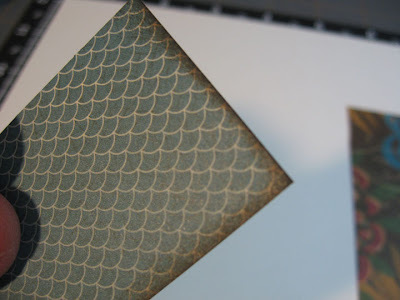 It started as bare wood, and I used a reinker and sponge brush to give it a Juniper stain, then covered it with paper, stamping, Stickles and ribbon. You could put any cute little sweet treat in here. This little rectangle tin came from Oriental Trading for super cheap. 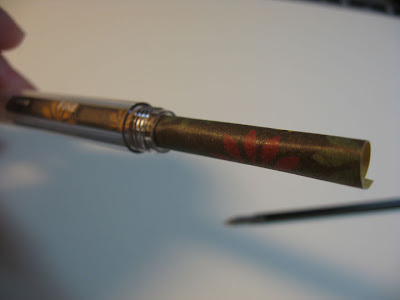 With some liquid glue, it's a snap to cover with paper. I topped off the stamped snowflake with a big Twilight corduroy brad. 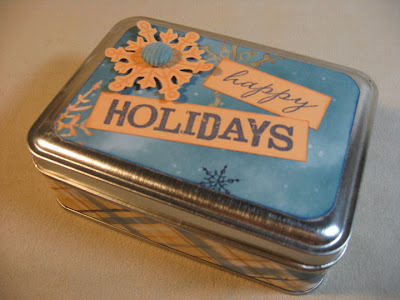 This tin could hold a gift card, pair of socks, fancy candies, or a wallet, or gloves, or... the possibilities are endless! I personally would love to get this as a gift. 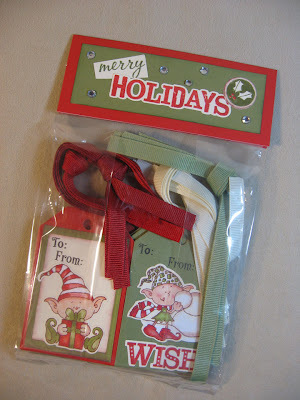 It's a 20-pack of gift tags. The trick to keep this simple and fast is to use a tag punch. I also kept it simple by mostly using stickers and only stamping the words "To" and "From" on each. I included coordinating ribbons and packaged it nicely. One of my daughter's teachers will be getting this this Christmas. 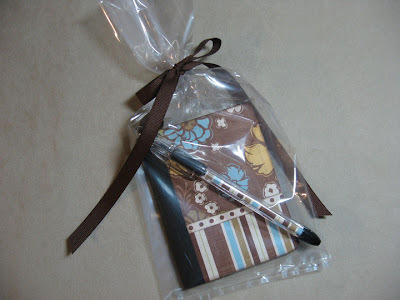 We always need a little gift bag, but sometimes don't have time to run out and purchase one. I like to buy the 10-pack of white bags at WalMart and keep them on hand to make my own personalized gift bags. 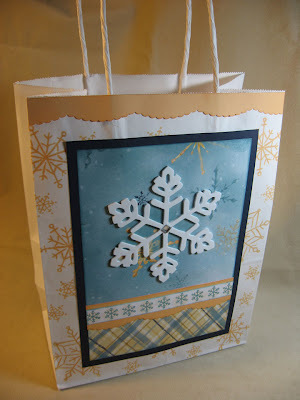 These bags are about 8 x 10 in size, so generous enough for large stamped images, punched images like this big Sizzix snowflake, and some pattern paper I had in my stash. I would love to hear your comments and also hear about quick gift ideas you have tried and love. 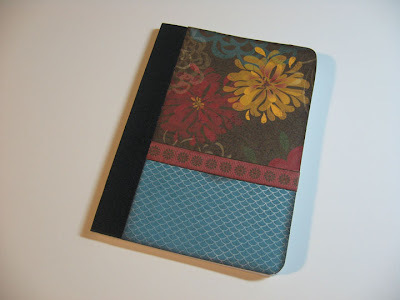 Leave a comment here and your name will go into my drawing for a FREE scrapbooking kit! 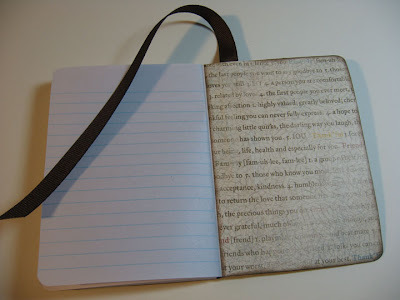 Okay, I told you you need to check out Tim Holtz's blog. His stuff is amazing and he's doing his 12 Tags of Christmas right now. I love everything he does and the tags are fantastic! I've been following along each morning and today was the perfect day for his inspiration. Mojo Monday! 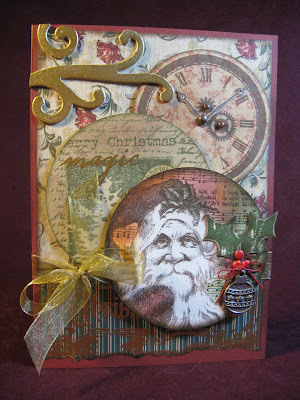 I used two stamps from Tim Holtz's collection (Santa & Christmas Carols). 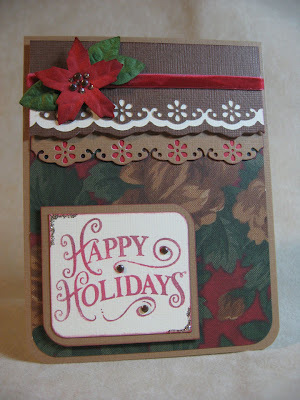 I added Close To My Heart's Vintage Christmas (holly and Merry Christmas with tree) and Make it Count (clock). The CTMH chipboard is embossed with gold and the brads in the clock are Antique Copper (regular and bitty sized). I added some Cranberry brads next below the holly and some Cranberry waxy flax attached to the metal ornament. I've had those ornaments a long time. Can't remember if they are Karen Foster or not. The ribbon is gold organdy found at Michael's. 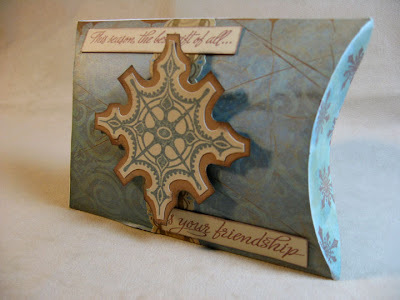 The patterned paper is CTMH's older Christmas print called Everlasting (I think). It has that old-fashioned look about it that works well with this card. I wouldn't have known what the heck the "Awesome Face" was unless I had a pre-teen. The way my 12-year-old describes it, it's a face that someone came up with and whenever you see it attached to anything, it automatically makes it "awesome." 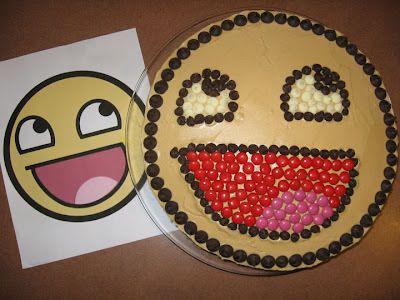 So for her birthday cake for today's party we decorated it with the Awesome Face, of course. So does that make the cake automatically awesome? The answer, I can only assume, is YES. We used M&M's and chocolate chips. The cake is dark chocolate fudge with my mom's peanut butter frosting recipe. I'm thinking of making myself an Awesome Face button to wear everyday, so that she will always think I am an awesome mom. Not a new idea. It's been around a while. 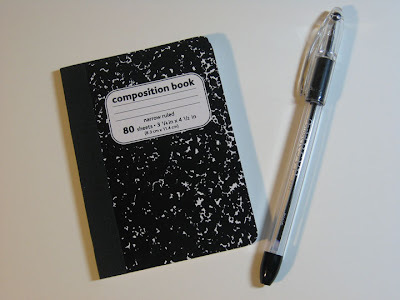 But I still can't resist these little composition books. They are tiny versions of the original and you can find them in office supply stores and good old WalMart for less than a dollar. Add some scraps from your paper stash and some ribbon and you have a cute little gift idea or stocking stuffer. The pens are Pentel RSVP ballpoint pens (originally found them at WalMart but recently can only find them at Office Depot). 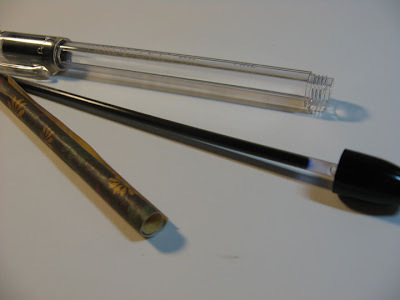 Sure, you can embellish them even more with flowers, brads, metal findings or more, but these are simple and streamlined so you can throw one in your purse and not worry about stuff getting ripped off or damaged. Follow along through the photos to see how easy they are to make. Then grab some papers and start cutting. 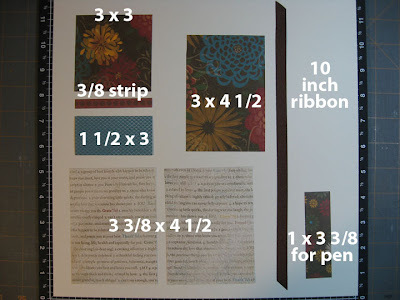 I use 3 coordinating papers and matching ribbon, cut to the dimensions shown here. 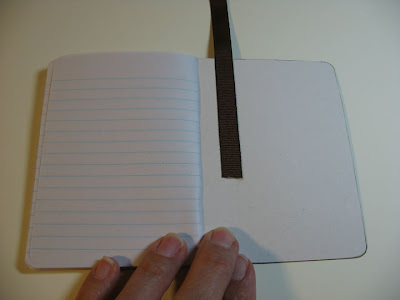 I ink all the edges of the papers with a Chocolate color on a sponge. 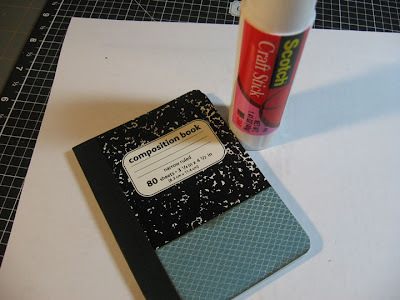 I use a good strong craft glue stick to adhere the papers to the book. I add the papers and the strip to the cover, trimming as necessary and re-inking edges as needed. I adhered the ribbon to the inside back cover of the book. Then I added the paper to the inside back cover, covering up the ribbon nicely. 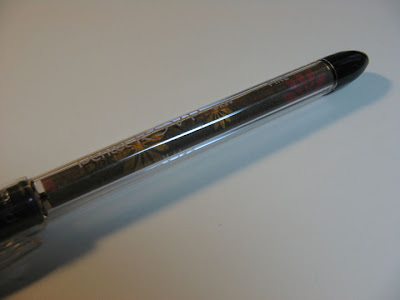 and inserted the paper into the pen. I screwed the pen back together. This is how it looks. The ribbon serves as a bookmark. 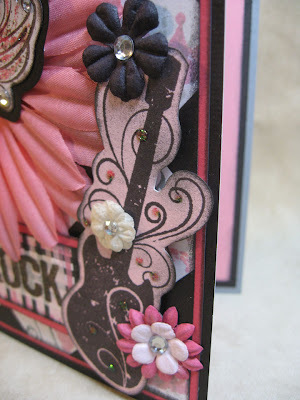 This set is cute with CTMH's Grace paper pack don't you think? 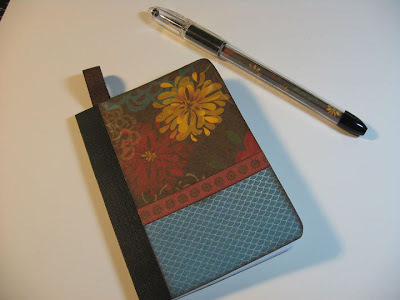 Okay, I know this isn't the same book and pen. This is another one I made. 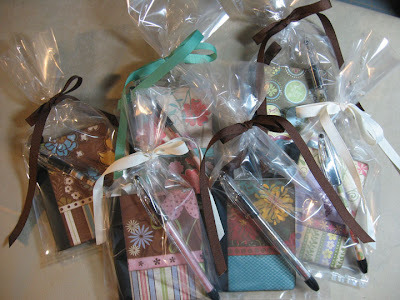 I finish off the set by packaging it in a cello treat bag and tie it off with coordinating ribbon. I made six of these today for a teacher friend of mine who ordered them for gifts to give her volunteers at school. 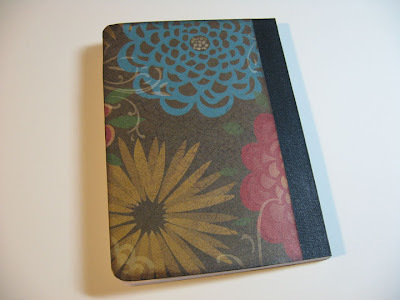 I enjoyed making them so much, I'm off to WalMart in the morning to get more composition books. Try one of these sometime. They are super fun! Happy Thanksgiving! Today is Thanksgiving #2 for us. 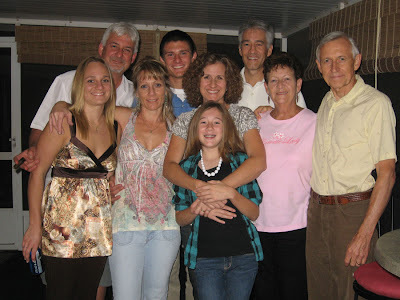 A small-scale version of yesterday with my in-laws. Yesterday was the Wolf Family day at my brother's house. Our day started off with the Turkey Trot 5K right in our beautiful Suntree community. I've run this for four years now, and Paul has for three, Jamie for two. We love this on Thanksgiving Day because we get that morning work-out in, then we can pig out on the feast! 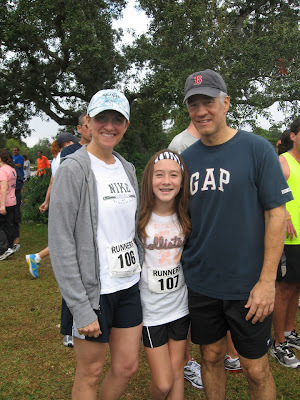 Jamie was feeling very independent this year and asked if she could run on her own in the 5K. The original plan was for her to run with Dad again like last year, but she wanted to do it solo. I was SO proud that she hung in there and ran it in even better time than last year: 33.20, I think. Paul was always about 150 yards ahead of me and no matter what I did, I couldn't catch him. So he finished well in his age group: 25.25, and I finished in 26.40. Not terrible for an old lady of 45, but I had hoped to beat my time from last year which was 25.40. There were close to 500 runners this year and the morning started off rainy and chilly, but cleared up as soon as the race began. It's such an exhilarating feeling to run in that big crowd! And the best part is the entry fees go toward the Juvenile Diabetes Research Foundation. Here's the Wolf pack from Thanksgiving dinner. My sister-in-law Brenda outdid herself this year with SO many delicious creations, one of them being a yellow squash casserole that was outstanding! My nephew Derek and his girlfriend Kristen (taking the photo) made a unique cranberry sauce with pineapple, oranges and pecans in it that I loved. My brother Steve smoked a turkey outside all night the night before, setting his alarm every two hours to get up and do whatever it is you do when you smoke a bird (stoke it? add more liquid?) Anyway, that smoked turkey was perfect! My sister-in-law roasted another turkey in the oven the traditional way and it was excellent. I brought a sweet potato casserole that seemed to impress (Cooking Light, Nov. 2009) complete with maple syrup, mini-marshmallows, and pecans on top. Yum! We spent the non-feasting time watching football, playing pool, talking, laughing and drinking. Just like it should be. I hope you and yours had a wonderful Thanksgiving too. Happy Thanksgiving to all you blog followers out there! Since I've been making so many Thanks- giving/Fall cards lately, I went for Christmas this time with the Mojo Monday sketch. Here's the sketch and here's my card. I used some older Daisy D's paper, a Making Memories poinsietta, and all the rest is from Close To My Heart, including the leaves which are from Just Blooms Summer Posies. The stamp set is "Holiday Joy", the textured card stocks are Desert Sand, Chocolate and Colonial White. The red velvet ribbon is from the Cranberry Collection Ribbon Rounds, and the bitty brads are Antique Copper. 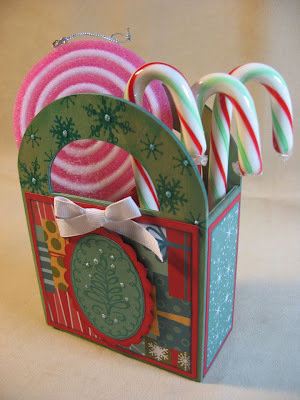 I added a little platinum Stickles here and there, and the punch is from Martha Stewart. My heavily-loaded schedule has finally ended and I am truly relishing the simple pleasures of every day. Friday was "New Moon" with Jamie. What fun! She loved the movie and I enjoyed taking time in the middle of a week day to be with her doing ANYthing. Saturday we had the best time with my gal pal Lisa Russell and her daughter Alivia at an arts & crafts fair in Titusville. Lots of laughs and a beautiful Florida day for an outdoor venue. I have practically been stalking this jewelry artisan, Michele Nesworthy. She does some amazing things with vintage watch pieces, metals, and findings such as vintage thimbles, spoons, and more. When you get an opportunity, check her out at MoonFairyGlass.com. In the evening it was such a pleasure to put on my jammies and simply watch TV all night with my family. It's been more than a month since I've been able to do that. Each night after working all day, I usually would eat dinner, then head back to my studio to work some more until everyone went to bed, finally getting myself to sleep around 11:00/11:30 which is a REALLY late night for me. It's been a very tiring month, but a lot of fun and filled with creativity. At the craft fair we saw some beautiful wreathes and, while I was tempted to purchase one, my pal Lisa urged me not to, convincing me that I could make my own. 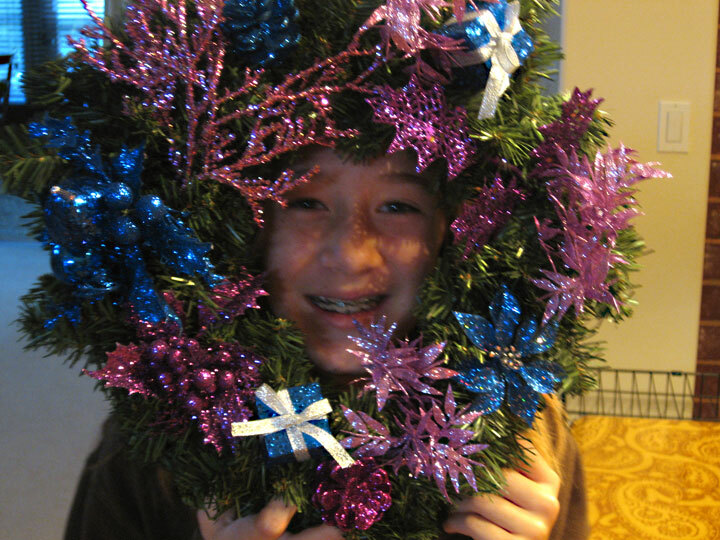 So we stopped at Michael's on the way home and she helped me pick out little pretty things for a wreath. Jamie got excited about the idea and wanted to make her own wreath too, so she picked out a few things to match her bedroom. 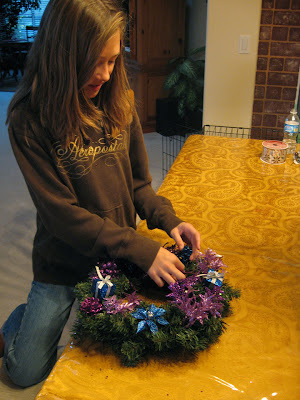 We came home, put on the Christmas music and got to the wreath making. 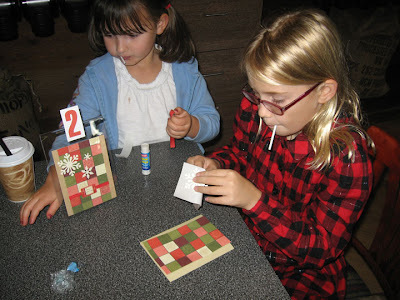 What a simple and enjoyable project to do together! And I can't even tell you the last time I pulled out the hot-glue gun. I forgot how much I love that sucker. 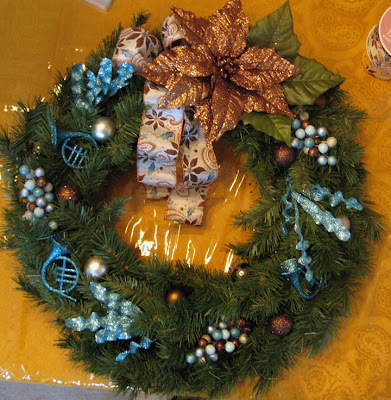 While the wreathes, I think, turned out pretty nice, I loved even more the time Jamie and I spent together making them. With a creative craft in progress, we talked easily about things, making jokes and acting silly. It was the greatest. These are the times that I am so thankful for a daughter. I am a very lucky mom to have such a pleasure of a child and little friend. I will try very hard to remember these times when she is being the devil tomorrow. (I wrote that because she just walked in and was reading over my shoulder.) Okay, she's gone... she's the best! Better late than never, I wanted to share the cards our Cards@9 group made together last week. They were all so beautiful and fun to make! 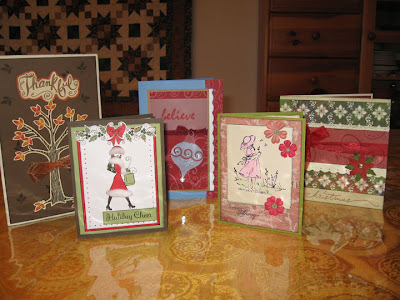 Pictured here from left to right are cards by Charmin, Tiffany, Lin, Joann and myself. As you can see, we use product from all over, not just Close To My Heart, although many of the stamp sets used in these particular cards are CTMH this time. This little cube is something I've been playing with the last few days. It's a photo/note holder cube. I thought it would be cute to show off different holiday cards I receive this year, switching out the card each day with a different one. Then Jamie can leave a note for "Santa" (as she now refers to him with air-quotes) on Christmas Eve. The cube itself comes from Oriental Trading Company and the papers are from CTMH's Jingle Level 2 pack. I incorporated some Twinkle Brads, and used the Christmas Melodies stamp set, plus a flower image from the Gratitude stamp set on the top. Cranberry velvet ribbon, plus some White Daisy ribbons finish it off. Wow! What a packed weekend. I am exhausted, but have been having a lot of fun. Friday was one of my favorite days of the month because it's a get-together of friends to make and exchange one of each other's handmade card creations. I've nicknamed it Cards@9 because we get together at 9:00 a.m. and make cards, then have a nice lunch. It's my favorite also because it's MY chance to sit and create something that someone ELSE has designed and pre-cut. Everyone's cards were SO pretty, I will have to share them with you tomorrow when I have more time. For now, here's us girls. . . from left is Joann, Tiffany, Lin, Charmin and me. 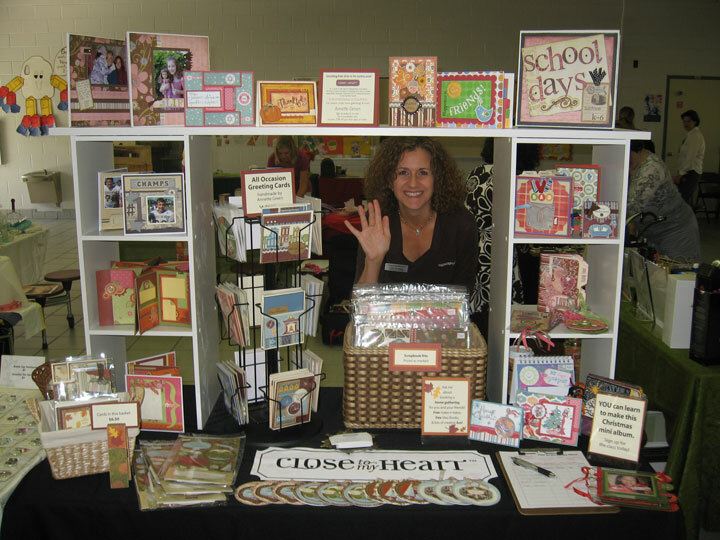 Saturday was my daughter's school's annual Fall Festival where she got to run around with her friends and have fun, and I got to be a vendor in the Marketplace section of the festival. It was a big success because I made some new contacts and got a few new sign-ups for an upcoming holiday album workshop. I was restricted to a rather small table (only 5 feet) so I figured if I couldn't spread out, I'd better go UP. This is my display... two cheap shelvy things from WalMart and one plank of closet shelving across the top from Home Depot that hubby cut down for me. It worked out perfectly and I have a feeling next year I'll be seeing more vendors doing the same based on the comments I received all day. Sunday was the first day of my Annual Holiday Workshop. 12 attended and 6 more are coming Tuesday night. 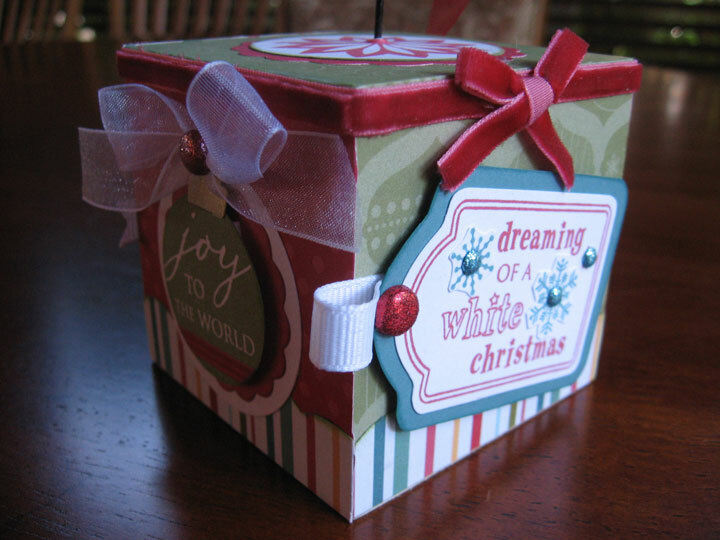 All guests made five Christmas cards, two Fall cards, 15 Christmas tags, one altered travel mug, and an altered wooden box. I haven't taken photos yet, but hope to post those soon. It was a big hit with everyone, so I was pleased. This workshop is a lot of work for me, but well worth it when I hear good feedback. 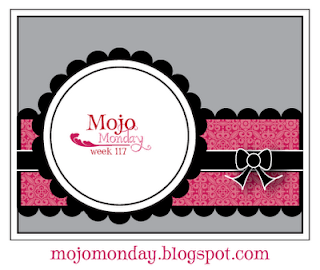 And finally MOJO MONDAY. 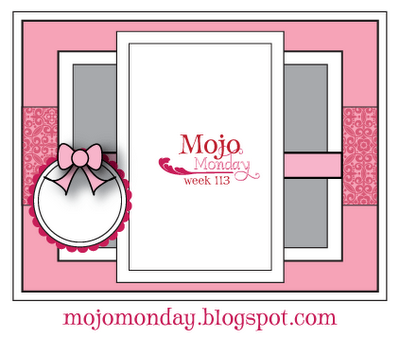 Here's the Mojo sketch #113 for this week. 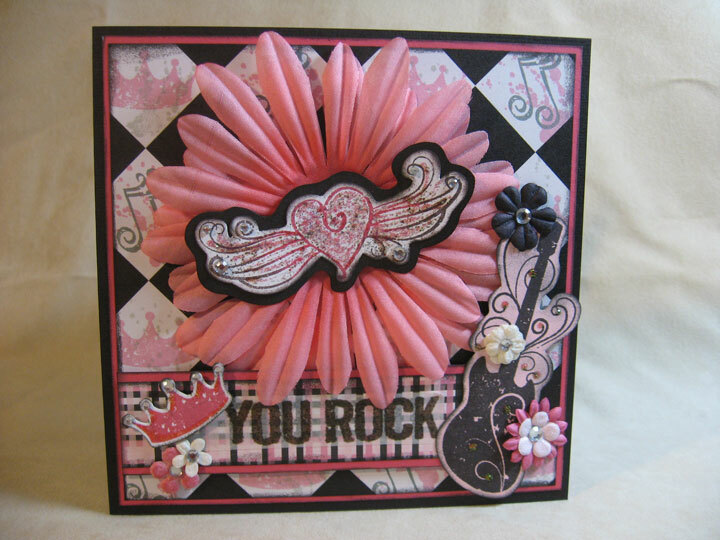 And here is the card I came up with. 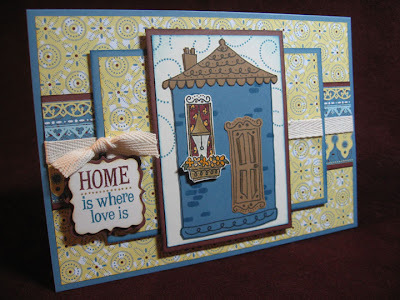 I used Close To My Heart's November stamp of the month, "Around the Block" which is very fun to play with because the stamp set has different doors, windows, shutters, roofs, and a bunch of other cute stuff. The combinations are endless! 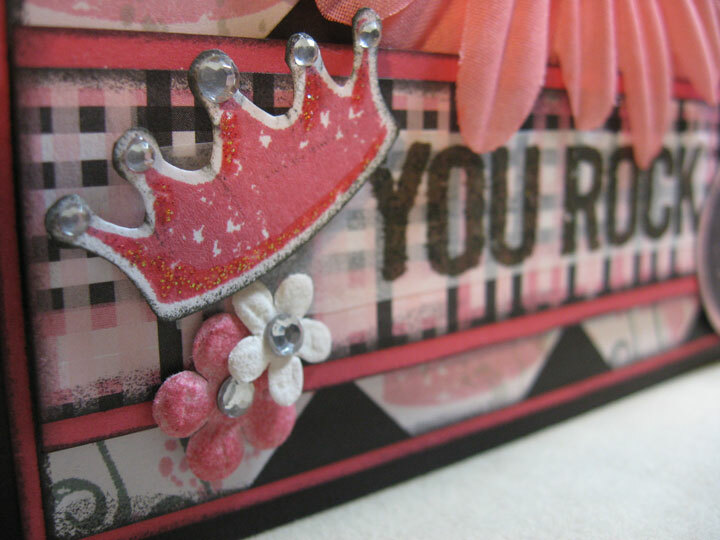 I also used the Sweet Home papers and a QuicKutz die for the sentiment. The ribbon is CTMH natural twill. Now it's time for bed!